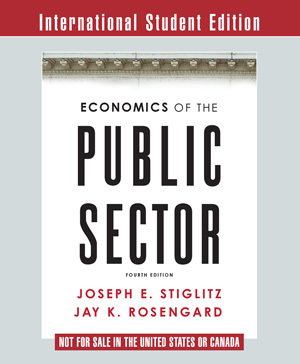 Economics of the Public Sector - Features | W. W. Norton & Company Ltd.
Economics of the Public Sector, fourth edition, focuses on the heavily changed, post-global recession world. 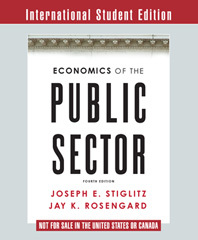 This new, modern approach includes a discussion on global public goods in Chapter 5, which addresses the difficulty of coping with public health and security threats when they transcend government coping mechanisms, while Chapter 8 examines corporatisation and the transition from government enterprise to private enterprise. Stiglitz and Rosengard write with the student in mind. Not only do they use accessible language, but also the graphs throughout the text are simple and easy to understand. Case studies and references to real-world programmes and policies, such as Welfare Programmes and the Redistribution of Income in Chapter 15, are found in the body of the text, ensuring that students are introduced to policy applications while they read. The authors introduce students to a global perspective by sharing their first-hand experiences working with foreign governments.